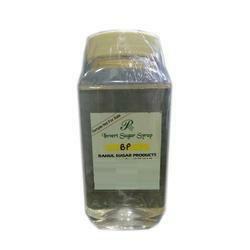 We are Manufacturers and exporters of high quality BP Invert Sugar Syrup from India. Our BP Invert Sugar Syrup is widely used in various Industries including Hotels, restaurants and Coffee shops. OurBP Invert Sugar Syrup is widely used in bakery, soft drinks, ice creams , herbal cosmetics and squashes etc. We are exporting BP Invert Sugar Syrup to various countries like UAE, GCC, Jordan, Israel , whole Europe,(Germany, Polland), UK, Indonesia, South Korea, Africa (Especially South Africa). Backed by a capable team, we are providing an extensive series of BP Invert Sugar Syrup. Our products are obtainable in numerous forms that meet on client’s demand. Owing to top quality and longer shelf life, our product is enormously used in the market. Moreover, we offer this product in different forms and packing option that meet on patron’s demand. In addition, we present this product at nominal costs. Ideal for all liquid formulations as well as medicinal syrups which are not palatable and therefore require sweetening -a replacement of sugar. As a source of instant energy due to a direct assimilation of glucose and fructose in blood without actually increasing body's insulin level. The quantity of additives like Glycerin, Propylene glycol and Sorbitol reduce considerably. It is 1.3 times (approx.) sweeter than Sugar on equal brix basis.